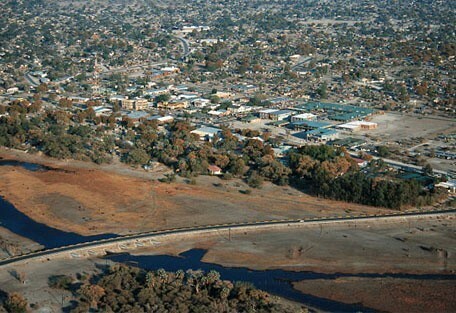 Maun is the fifth largest town in Botswana. 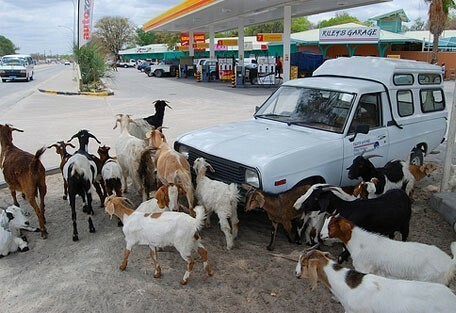 It is an eclectic mix of modern buildings and native huts and now has shopping centres, hotels and lodges, as well as, car hire; although it retains a rural atmosphere and local tribesmen continue to bring their cattle to Maun to sell. The community is distributed along the wide banks of the Thamalakane River where red lechwe can still be seen grazing next to local donkeys, goats and cattle. Maun is a gateway for exploring much of northern Botswana; for example it is the natural hub for visitors from outside the region to explore the Tsodilo Hills and the Makgadikgadi Pans. The Thamalakane River discharges to the Boteti River, whose seasonal high flow reaches the Makgadikgadi. 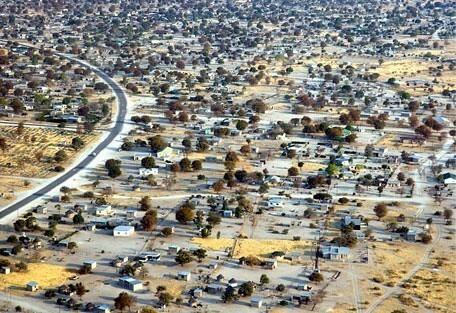 Maun is the fifth largest town in Botswana. Although it retains a rural atmosphere with local tribesmen bringing their cattle to Maun to sell, it has developed an eclectic mix of modern buildings and native huts and now has shopping centres, hotels and lodges available. The community is distributed along the wide banks of the Thamalakane River where red lechwe can still be seen grazing next to local donkeys, goats and cattle. Maun is a gateway for exploring much of northern Botswana; for example it is the natural hub for visitors from outside the region to explore the Tsodilo Hills and the Makgadikgadi Pans. The Thamalakane River discharges to the Boteti River, whose seasonal high flow reaches the Makgadikgadi. Gateway to the country’s chief national parks and attractions. 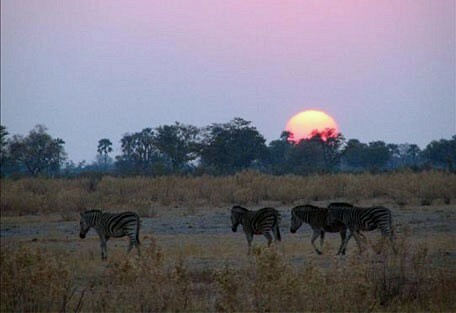 Maun Game Reserve is conveniently situated within walking distance of the town. Still only taken as a village, Maun has developed into one of Botswana’s main tourist areas. Perfect base at which to use whilst visiting Botswana's wildlife areas. Marina's lies about 8km north of Maun, about ten minutes drive from the airport, along the Shorobe Road, which leads to the Moremi Game Reserve in the Okavango Delta. It's located in a residential area – with plenty of people around. The Maun Lodge is a small, but efficient, hotel on the banks of the Thamalakane River, 4 kilometres from Maun Airport and 2,5 kilometres from Maun’s CBD. 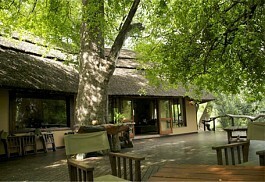 The Maun Lodge is the ideal stop-over for tourists on their way to or from the Okavango Delta. 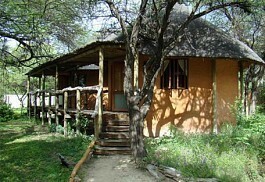 Crocodile Camp is a 12km drive from the small town of Maun towards the Moremi Game Reserve in Botswana. Situated on the banks of the Thamalakane river, the camp hosts an abundance of bird life with the occasional hippo or crocodile. Thamalakane River Lodge is placed on the banks of the Thamalakane River, just 19kms from Maun, and en route to the famous Moremi Game Reserve. 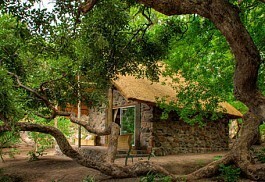 Stone chalets are positioned in the shade of the riverine forest, overlooking the river. 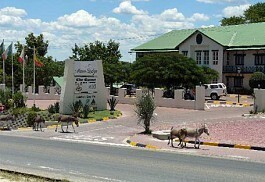 Riley's Hotel is one of the legendary tourist establishments in Botswana. This Maun hotel is a premier stopover for tourists on their way to the Okavango Delta, Savuti, Chobe National Park or Moremi. Royal Tree Lodge is a private game reserve located twenty minutes from the iconic safari town of Maun, on the banks of the Thamalakane River - the gateway to the Okavango Delta. Maun conducts of a multitude of safaris and hosts air-charter operators, which have their offices dotted all over town, and towards the airport. 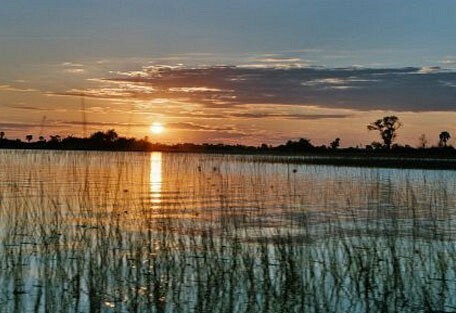 Being a prime take-off location for tourists going on safari, Maun offers powerboat, car, and 4-wheel drive vehicle hire. 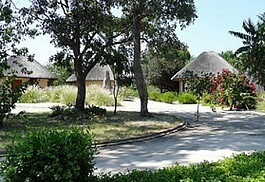 Within walking distance from the town itself, the small, hidden gem of Maun Game Reserve is located. Visitors can view giraffes, kudu, impalas, warthogs, and a variety of birds here. 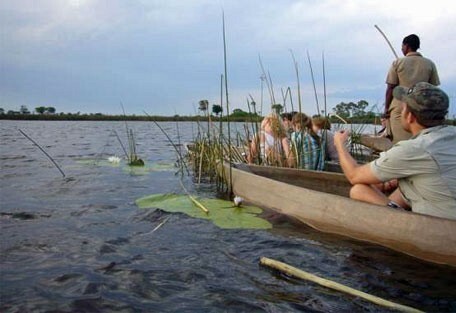 Day cruises up the Thamalakane River in Maun are extremely popular and visitors can enjoy fishing and swimming, as there are no crocodiles in the area. The Nhabe Museum has regular exhibitions hosted by friendly and informative staff, and offers a splendid gift shop. Being the gateway to Botswana’s tourist attractions, Maun is the ideal stopover en route to Okavango Delta, Moremi Wildlife Reserve, Makgadikgadi and Nxai saltpans, and Lake Ngami. The Okavango Delta's unique and diverse ecosystems are formed as a result of the many islands that emerge from its waterways and are home to a vast number of game, different species of fish, and birds. Crocodile Camp is situated on the banks of the Thamalakane river and hosts an abundance of bird life with the occasional hippo or crocodile paying a visit; all of which can be viewed while enjoying spectacular sunsets from the bar deck. Maun Lodge is the ideal stop-over for tourists on their way to or from the Okavango Delta, one of Botswana’s premier tourist attractions. 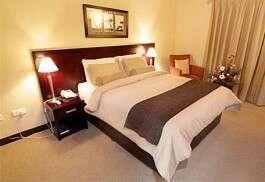 It is a near 4 km from Maun Airport and 2,5 km from Maun’s CBD. The months May to August produce good, comfortable temperatures in Maun, while average temperatures are generally high in this region of Botswana; the highest being in October at about 35 decrees celcius. Maun receives summer rainfall during the months of November to February, particularly in November at the start of summer, whereas, July receives the least rain and has the coolest temperatures, which are around 8 degrees celcius.